I don’t mind that many of the voodoo drums in my record collection are fake. The interest in exotic cultures provided a lot of work for studio drummers in the 60’s. As long as the songs are exiting it is okay to me. Still, there is nothing like the real thing, of course. 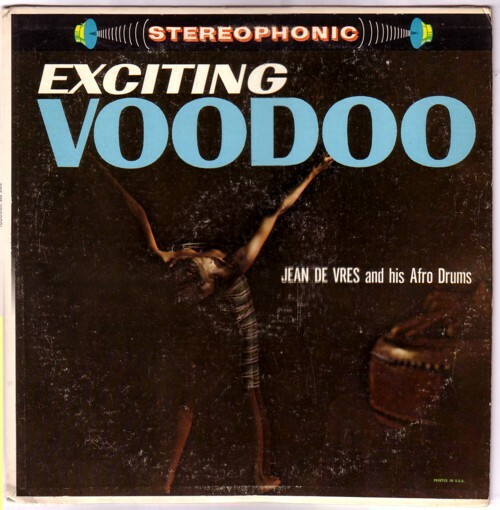 On the Palace label there is an LP named Exciting Voodoo , released by Jan de Vres & his Afro Drums. The other LP’s on this label have titles like Riverboat melodies , Viennese waltzes And In Polka time , so you might expect that the voodoo on the LP by Jan de Vres is neither voodoo nor exciting. But to my surprise it is both. Well, it is exciting, I am not 100% sure about the voodoo, to be honest. But with songtitles like Voo-voo , Voodoospirit song and Ao-mao i gladly settle for the benefit of the doubt. There are several compilations out with fake voodoo songs. 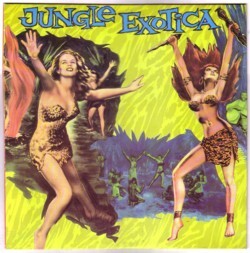 One of my favourites are the two LP’s/CD’s called Jungle Exotica, released on the Strip label. Although the selected songs cover a wide variety of genres, from straight 50’s rock’n’roll to instumental exploitation records, the compilations are perfect soundtracks for B-movies that only exist in my imagination. Many of the other compilations are too soft to sooth my taste. But I know that there is enough material available to come up with a real cool series of Voodoo Drum CD’s. So, where are they? To get you in the mood to do some searching, here is Drum festival by Jan de Vres & his Afro Drums.